“A picture is worth a thousand words”. Through the windshield on a recent foray into trout country attempting to find fishable water makes one ponder the sanity behind such actions. At times during the early season journeys to western rivers and streams simply were a bust; reservoirs filled to beyond their thresholds regurgitating torrents downstream, monsoonal rains taking stream levels even further beyond their natural limits. 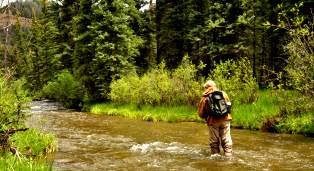 Yet, the adventure of the unknown that early season fishing yields is often justification alone; seldom predictable, occasionally successful, always intriguing. 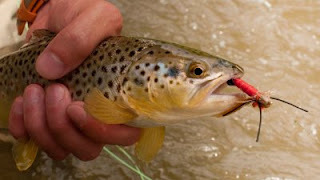 Given the patience of those who pursue trout with fur and feather this wet season has been trying. For others willing to roll the dice, there are rewards and discoveries that only the wrath of Mother Nature’s violence can conjure up. If you are serious about finding good water to fish when seasonal conditions are so unpredictable better leave home with a full tank, a thermos of coffee or two, pack a lunch and don’t plan on heading pack anytime soon. You should also have a plan if you are hoping to have any opportunity at success. That said, even the best laid plans this spring have failed to deliver. In a recent trek, the undertaking revolved around a reliable rumor involving Salmon Flies. Upon arriving at our destination, Salmon Flies may have been around, but the evenings down pour had negated any such opportunities. 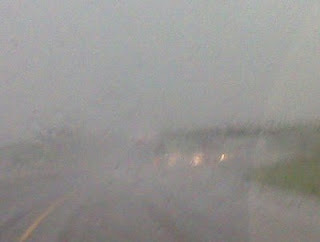 We moved finding the next piece of water in better shape, but also suffering from the previous nights deluge. Hours later we climbed to 9660’ the road eventually vanishing into a gray wet abyss before dropping into the canyon. Gnarled aspens still void of leaves eerily rose obscured by the summits dense blanket. This image fueled a growing skepticism. Descending the sun navigated through the ashen vapors illuminating a distant hillside lending hope to our dwindling spirits, the brilliant display only temporary. Pulling over the rain continued to follow us, yet below the streams currents ran clear, a stark contrast from those waters we viewed earlier in the day. Rain drops dimpled the surface. Downstream a trout rose, its residual ring dissipating in the streams quiet currents. Those miles and swollen rivers we had left behind quickly transcended into distant memories. PMD’s, Drakes, and Blue Wing Olives struggled to rid them selves of the stream. Those that struggled quickly disappeared, the streams piscatorial predators taking advantage of the easy meal. They showed the same eagerness for our flies, as long as the drift was true. At times that didn’t even matter. At days end we gathered in a brief interlude of sun, riding ourselves of a damp chill. 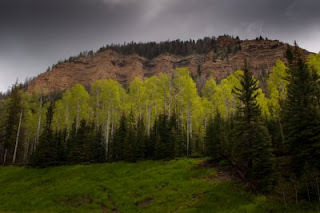 The valleys Aspens and Willows glowed, their newly emerged foliage shimmering in various shades of luminous green. Just before departing we witnessed a Golden Eagle’s rage as it fell from the sky in an attempt to red an unsuspecting Redtail from its turf both perilously plunging earthward. The hawk pulled up, the less agile Golden continued to descent before recovering to continue its ill time pursuit. This alone was worth the journey.